Arguments for shareholder primacy are deeply flawed, but that does not mean that companies in liberal market economies will readily deviate from this norm. For reformers, the question is what is feasible and which alternative is likely to work tolerably well… The advantage of implementing management-led stakeholding is that it can be initiated, if not completed with minimal structural changes to formal governances… [Alternatively, t]he governance-led stakeholding approach argues that control rights for non-shareholders are needed, either directly or by proxy. But the choice of how shared control is implemented needs careful consideration. We know that employee representation can work well in some contexts but we know less about the exact nature of the social glue and informal conventions that underpin this, and that are likely to be more important than the prospective codes themselves. Without first having strong employee organizations, general representation may prove a hollow achievement. – Ciaran Driver, ‘Fixing the corporation’, pp 254-255. Corporate Governance in Contention, edited by Ciaran Driver and Grahame Thompson (Oxford University Press, 2018), offers an exemplary overview of some of the most important debates in scholarship on corporate governance in Europe and North America. This characteristic alone makes this book essential reading. It does not offer the comprehensiveness we might expect from a handbook, but nevertheless the breadth of the empirical scope of the chapters is impressive – as is, even more so, the editors’ skill in forging a highly coherent collection, with a clear analytical agenda, despite the broad range of issues covered by contributors. The tone is set by Driver and Thompson’s introductory chapter. They depict debates around corporate governance along a spectrum bookended by two alternative ideal-types: shareholder primacy and stakeholder involvement. It will be no surprise to most readers that a large chunk of the book is devoted to a critique of shareholder primacy – the notion that the suppliers of equity finance are the rightful owners of a firm – or, more precisely, the application of this concept in practice. For the stakeholder perspective, ‘finance is not the only input’. Enterprise: the contribution that a governance model makes to investment, innovation and risk-taking more generally. Collective engagement: the way that a firm’s many interested parties – and talents – contribute to its business model. Politics: the distribution of power, income and risk that a governance model enables and reflects. It is clear that shareholder primacy is found wanting when dissected in these terms. But it is less clear that a viable alternative has yet been found. As the opening quote above from Driver’s chapter on manager control and employee representation suggests, while this is a book determined to promote alternatives to shareholder primacy – it subjects these alternatives to critique too. Prem Sikka’s chapter on the saga of BHS is a case in point. Family ownership – more common in the German Mittelstand – offers the illusion of a more long-termist approach to firm development, but the way it interacts with corporate governance norms in the UK more generally actually exacerbates the problems of shareholder primacy. Steen Thomsen’s chapter promotes the Danish model of foundation ownership, but cautions against the notion that it could easily be exported to other jurisdictions, relying as it does on an enabling body of law – in fact the UK is moving in the opposite direction. Driver’s chapter is the best example of this scepticism, insofar as alternative models based on employee representation are assessed in the context of myriad forms of stakeholder involvement. Discussing various issues around representation, information and organisational reform, he settles, somewhat unenthusiastically, on ‘tilting the balance’ within corporate governance towards ‘not-so-senior management’, as an ‘acceptable testing ground for a broader degree of stakeholding for which institutional supports still need to be built’. Such executives are shown to have a long-term interest in the firm’s success, as well as more direct contact with the workforce in general. This scepticism is especially interesting given that Corporate Governance in Contention’s origins lie, in part, in the excellent pamphlet produced by Driver in collaboration with the Trades Union Congress (TUC), Beyond Shareholder Value: The Reasons and Choices for Corporate Governance Reform. Yet the TUC’s mission is to promote trade unionism as well as the interests of its member unions. Although it is rarely articulated explicitly, there is certainly a tension around whether the UK any longer has the kind of industrial relations that would mean worker involvement in corporate governance represents a genuine challenge to shareholder primacy, especially on the dimensions, noted above, of enterprise and politics. As such, Corporate Governance in Contention perhaps offers a useful corrective to the corporate governance reform agenda which is gathering pace on the left in UK politics. Greater diversity in corporate governance models was one of the solutions offered by the Commission on Economic Justice, and especially the Labour Party’s popular Alternative Models of Ownership report, which provided much of the groundwork for current Labour policy, including the employee ownership fund idea outlined at the 2018 party conference. There is nothing wrong, at all, with the pursuit of these ideas. The question, really, is how much difference they will make in practice. George Osborne was so confident about the limited impact of employee ownership funds that he suggested his own version in 2012 (albeit with rather more neoliberal strings attached). Without being accompanied by a more transformative macroeconomic policy and industrial strategy agenda, a progressive corporate governance programme risks having an impact only on the fringes of the UK private sector. On the other hand, it has to be noted that much of the scepticism about alternative models in Corporate Governance in Contention derives from an adherence to the ‘varieties of capitalism’ (VoC) framework. This is a framework which perhaps itself warranted a critical look in this book. There is an interestingly novel (and largely supportive) take on VoC in Fabio Landini and Ugo Pagano’s chapter on ‘the evolution of corporate species’, as well a few hints of disquiet with the rigidity of a VoC framework (or at least its boiled-down, almost-caricatured version) throughout the book. Most political economists would argue that the combination of financial crisis, stagnant productivity and Brexit provides an opportunity – as long as, to paraphrase Marx, we are content to make history in these less-than-ideal circumstances – to rethink some of the foundational practices of Anglo-liberal capitalism. To that end, the book’s final part, and shortest part, stands out. It consciously seeks to broaden the discussion. Colin Crouch offers an account of market structure and consumer interests to demonstrate the inequities and inefficiencies of shareholder primacy, arguing that the distorted markets in which most firms operate severs the link between shareholder control, profit and consumer welfare. Jette Steen Knudsen considers the treatment of externalities in the distinct corporate social responsibility arena, and what lessons this might offer for corporate governance. This part of the book left me wanting more – there is plenty of scope for a sequel! There is surely an agenda here marrying both corporate governance and corporate social responsibility to industrial reorganisation around global production networks. Furthermore, the book was missing a feminist perspective on corporate governance (as well as featuring relatively few female authors). There was also not quite enough on the relationship between corporate governance and the new world of individualised pensions. Returning to labour, future scholarship on corporate governance would benefit from inter-breeding with accounts of the rise of precariousness and the hollowing out of the traditional employment contract; this trend perhaps reinforces Driver’s scepticism about employee representation, but, again, could provide opportunities for a more fundamental rethink around alternatives to shareholder primacy. As in fact demonstrated by the scholarship on global production networks and pensions reform, and feminist accounts of work, the world of labour relations might be a little messier than suggested by the mainstream corporate governance literature. 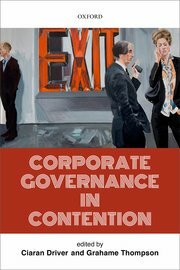 Corporate Governance in Contention does a wonderful job of clearing the ground for this more expansive agenda, and is, for the most part, extraordinarily well-written. But let us hope that the dialogue it captures continues in as many new directions as possible.